Could Còsagach be Scotland's version of Hygge? Scotland could offer visitors a rival to the Danish concept of Hygge, according to the country's tourism body. 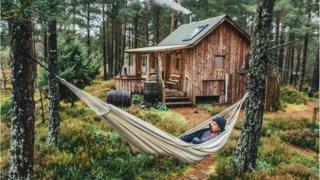 VisitScotland says the concept of Còsagach, which it defined as a feeling of being snug, sheltered or cosy, could be one of the trends of next year. The tourism body said this was a close parallel to Hygge, a lifestyle trend in the UK in recent years. It says businesses should create places where visitors can "relax and unwind". VisitScotland said Còsagach - an old Gaelic word - was about encouraging businesses to create environments which "induce a feeling of warmth or cosiness". It says Scotland is well placed to capitalise on its "tranquil seascapes, vast open spaces and many warm and welcoming pubs". There have been other attempts to repeat the success of Hygge - described as a type of cosiness and comfort that engages a feeling of contentment or well-being- as a lifestyle trend in the UK. These have included the Swedish principle of lagom and the Japanese concept of ikigai. Authenticity and immersion - using opportunities to "incorporate provincial and authentic experiences"
VisitScotland's senior tourism insight manager Chris Greenwood said: "In today's rapidly changing world, having an informed outlook is vital. "Tourism is more than a holiday experience. It is integral to sustaining communities across Scotland by generating income, creating jobs and stimulating social change - and is increasingly sensitive to consumer trends and economic conditions. "Our annual trends review has highlighted key trends developing within the tourism sector for the coming year, with the intangible link between the visitor and landscape set to play a significant role."